Add some color to your porch or deck railings with these beautiful scrollwork planters. Available in two sizes, the black iron design features intricate scrollwork and includes an adjustable bracket to fit rails between 2"-5 1/4" wide. Planting area in small planter is 11"L x 6"W x 5"H. Large planter is 19"L x 6"W x 5 1/4"H. Plants and lining not included. Size available in Small or Large. 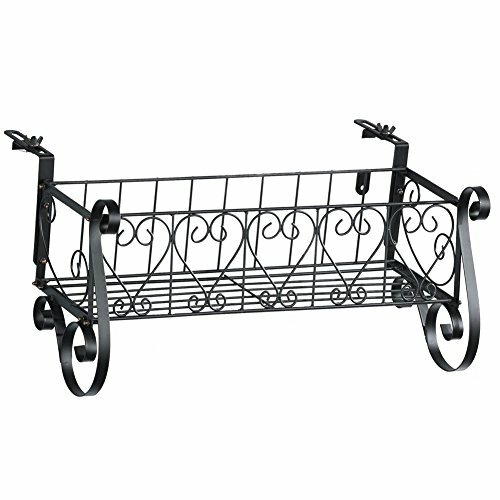 Black iron design features intricate scrollwork and includes an adjustable bracket to fit rails between 2"-5 1/4" wide. Plants and lining not included. Large planter is 19"L x 6"W x 5 1/4"H. Planting area in small planter is 11"L x 6"W x 5"H.
If you have any questions about this product by Collections, contact us by completing and submitting the form below. If you are looking for a specif part number, please include it with your message.